The deliveries of 2019 Bajaj Dominar have commenced across some cities. Ahead of an official launch, the prices of the sports cruiser have been revealed. 2019 Bajaj Dominar has been significantly updated, which gave it an improved engine, better suspension setup and minor features addition. It has been priced at Rs 1.74 Lakhs (ex-showroom). The deliveries of the updated Dominar have commenced in select cities. A dealership in Thane has already delivered 3 bikes. More deliveries are scheduled to happen today across different Bajaj dealerships. Photos of the updated Dominar at dealerships have started coming up online. As per reports, the bikes have already reached dealerships in Mumbai, Pune and Delhi. A Mumbai dealer has shared the complete pricing list. The price list has all the details of insurance, registration and other things related, which take the on-road prices up to Rs 2.22 Lakhs. The 2019 Bajaj Dominar receives a price hike of nearly Rs 10,000 over the older generation. However, if you see the price list, heavy discount of Rs 13000 is offered on the older Dominar, which takes the effective price down to Rs 1.97 Lakhs. The older one is nearly Rs 15,000 cheaper than the new one. The 2019 Bajaj Dominar uses the same 373cc liquid-cooled engine, but gets dual-camshafts now and slightly increased power figures. Instead of the earlier 35 BHP and 35 Nm of torque, the new model makes 39 BHP and 35 Nm of torque. The telescopic forks onboard are now replaced by premium Upside-Down Forks. At the back, the same monoshock is used. For braking, the Dominar uses disc brakes at both the ends paired with dual-ABS as standard. Feature additions onboard include a revised instrument cluster and a new digital readout fitted on the fuel tank. The small screen displays information such as odometer, gear position indicator, clock and much more. 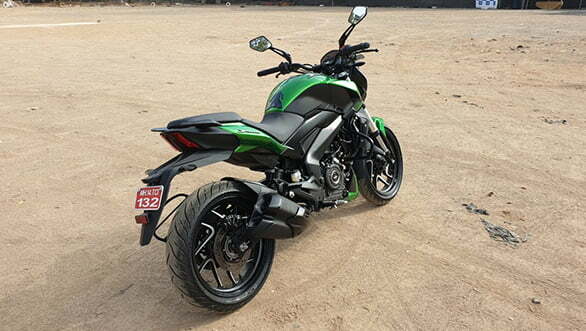 Now, the 2019 Bajaj Dominar is available in a new Green colour option, alongside the Matte Black colour. Earlier, it also came in Red and White offerings too. Dominar competes against the likes of Royal Enfield Classic 350, Jawa Motorcycles and KTM Duke 250.